5 bucks richer today fellas. Or 9 with bird now? Unfortunately with how Limes are designed it is impossible to stack unless you use a Bird as a base or have a buffer on top of your bottom Lime, like a 2x4. A cargo bike would work well to pick up scooters, and it wouldn't take that long to break even, depending on the cost of the bike. I bet you could fit 10 scooters at least on it, so- 2000(10*$3)=66 days. Making two trips a day and mixing some limes in there would have it down under a month. Not bad, and you'd be paying for it by using it. Version 2.0 of the Lime-S will be deployed when the city approves additional scooters (still at 250). It is manufactured by Segway and has the speedometer on the top! 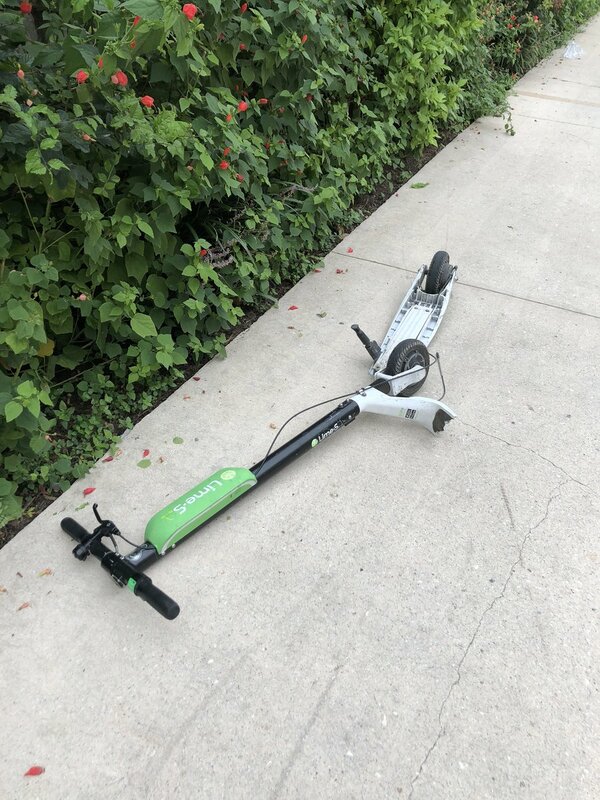 Bird is apparently testing out leaving higher charged scooters out on the streets overnight and unavailable to capture. This would apparently be a breach of their agreement with the city. And you might be seeing the newest version of their scooter soon that is around 45lbs. I used that newer Lime for a month or so before their KC launch and it doesn't feel that much different than the ones on the street (both were still more substantial than the Birds we have). The speedo is a nice touch, and it also shows battery life and charging status. Ah, if batteries can be swapped in field that should simply things a great deal - though maybe not if older scooters still in the mix. Neighborhoods with single family homes might complain about scooters left overnight but shouldn't be a big deal to rest of city. Don't the scooters only last like 120 days in the field? I would enjoy the ability to scoot home in the wee hours. Would save me paying uber. You can with Lime currently. Oh? I did not realize. The newer scooters are actually different than the one you had (I checked your Twitter photos). These are totally manufactured by Segway and offer advances that the two versions by Electisan don't (front/rear shocks, fully enclosed brake lines/brake handle that is identical to the gas, is MUCH lighter than the version we have now, etc.). Lime 2.0's are out and about! I rode one today and the speedo is a nice touch. It honestly felt a little wobblier than a Bird, and accelerates slower I feel, but overall a nice rider experience. The back wheel is also used as a step-on brake in addition to your handle, so step on the wheel cover to add additional braking power (it needs it). The scoots also have underglow which will be a nice touch and help with visibility at night. "Underglow", my new favorite word. Looks like the Segway built Lime scooters have a 35 mile range instead of 23. If these newer scooters can last a day or two on one charge as well as replaceable batteries in field, can see why they'd want to leave out overnight. Limes are available overnight. They go up for charging on varying levels at different points of the night, but you, me, or anyone can go rent at any point if they come across one. A few may go a few days before being picked up by an employee or juicer. With the new Electisan Bird, they have stated to chargers that they will only be able to be picked up if they are practically dead, so those should be the only birds left out overnight, but still not available for a ride until 0400. A lime employee also let me know these were accidentally released, so you might see a few strays, but they were trying to clear them back out for some "bugs". The *official* word from Lime is 10pm. I'm in San Antonio today, where Bird and Lime have been for about six months. Anecdotally, locals say usage has dropped off but there are a LOT of them downtown. Lots of sidewalk riding -- way more than KC -- which I attribute to lots of one-way streets and most of them are pavers that make for a very rough ride. Saw my first busted Lime on the sidewalk with the battery removed. saw a bunch of limes in dallas, also riding on sidewalks, particularly near SMU campus this weekend.